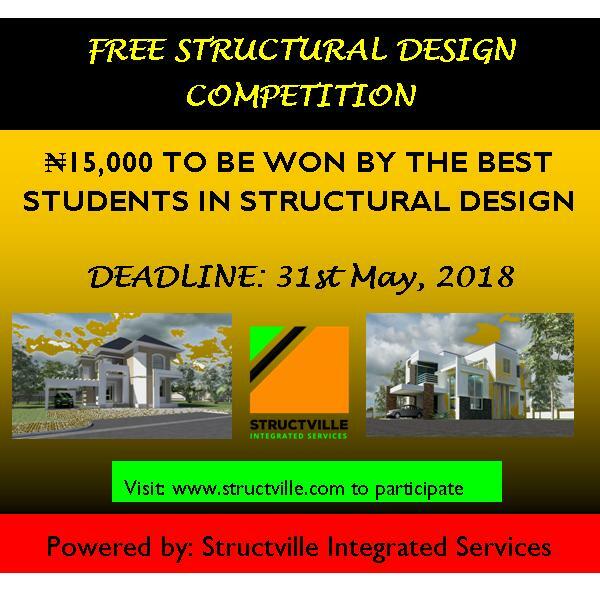 Structville Integrated Services is calling on civil engineering students in various universities and polytechnics in Nigeria to participate in her first structural design competition. This is in line with our ambition of promoting civil engineering knowledge among students in Nigeria, and encouraging the hardworking ones to keep their efforts up. 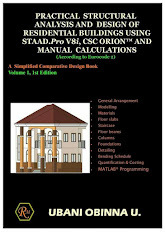 We also believe that this will help ignite the love of structural engineering among students. For this competition, serving NYSC members are also eligible to participate. NOTE THAT PARTICIPATION IN THIS COMPETITION IS BY CHOICE, AND IT IS ABSOLUTELY FREE. The relevant drawings for the building are given below. You should however download the questions and soft copy of drawings for more clarity. This can be obtained by following the link below. (1) This design may only be carried out using BS 8110-1:1997 or Eurocode 2 only. (2) All designs must be FULLY referenced to the code of practice used. (3) You are to provide the member sizes, except the thickness of the floor slab. (4) All assumptions made in the design must be explicitly stated, and all other references well cited. (5) All analysis and design must be manually done. Do not skip any step on calculation or you will lose marks. All works must be shown. (6)You can type set your calculations using MS Word (Font style: Comic Sans Size: 12). If you are using pen, the design must be neatly done on plain A4 paper, scanned and compiled to MS Word or PDF format before being sent. Documents sent as jpeg will not be assessed. (7) Detailing sketches can be done manually or using AUTOCAD. (8) Where necessary, use sketches to drive your point home. (9) Your name and application number must be clearly stated on your design sheet. (10) Neglect roof load in your analysis. JAMB admission slip, School ID card, or Departmental ID card to info@structville.com. Corp Members must provide Corpers ID card. This submission must be done before final submission of answers. (4) You can also download the architectural drawing in .DWG (AutoCAD) format below. (5) If your application is approved, you will be issued an application number. However, you can start your design pending your approval. (6) The deadline for submission is 12 mid night, 31st May, 2018. Outstanding students/participants will have their designs published so that the whole world will see what they have done, and why they were selected as the best. The most outstanding student will also be featured on Structville, where his profile will be published, and his achievements celebrated. So by participating in this competition, you are consenting to this. The whole aim of this exercise is to teach, and to inspire. Wow, am short of words for this. This is impressive. I wish I was still in school but all d same am privileged to be an avid reader of this blog. Thank you Engr ranks and ur partners for putting this up...thank u.